1. being, happening, or coming at the end or after all others: the last horse in the race. 2. being or occurring just before the present; most recent: last Thursday. 5. only remaining: one's last cigarette. 7. least suitable, appropriate, or likely: he was the last person I would have chosen. a. final or ultimate: last rites. b. (capital): the Last Judgment. 9. (postpositive) dialect Liverpool inferior, unpleasant, or contemptible: this ale is last. 10. after all others; at or in the end: he came last. a. most recently: he was last seen in the mountains. 16. the final appearance, mention, or occurrence: we've seen the last of him. 1. (when: intr, often foll by for) to remain in being (for a length of time); continue: his hatred lasted for several years. 2. to be sufficient for the needs of (a person) for (a length of time): it will last us until Friday. 3. (when: intr, often foll by for) to remain fresh, uninjured, or unaltered (for a certain time or duration): he lasted for three hours underground. adj. a superl. of late with later as compar. 1. occurring or coming after all others, as in time, order, or place: the last line on a page. 2. most recent; next before the present: last week. 3. being the only one remaining: my last dollar. 4. final: in her last hours. 5. ultimate or conclusive; definitive. 6. lowest in prestige or importance: last prize. 7. coming after all others in one's expectations, considerations, etc. : the last person we'd want to represent us. 8. individual; single: Don't start until every last person is present. 10. after all others; latest: I arrived last. 11. on the most recent occasion: He was alone when last seen. 13. a person or thing that is last. 14. a final appearance or mention: That's the last we'll hear of it. 15. the end or conclusion: going on vacation the last of September. 1. at (long) last, after considerable delay; finally. 2. breathe one's last, to die. 1. to go on or continue in time: The festival lasted three weeks. 2. to continue unexpended or unexhausted; be enough: Enjoy it while the money lasts. 3. to continue in force, vigor, effectiveness, etc. 4. to continue or remain in usable condition: The gloves didn't last. 5. to continue to survive for the duration of (often fol. by out). 1. a wooden or metal form in the shape of the human foot on which boots or shoes are shaped or repaired. 2. the shape or form of a shoe. 3. to shape on or fit to a last. a load or burden; an amount of cod or herrings [12 barrels]; a measure of grain or malt [80 bushels], hence, a large, indefinite number. Last can be an adjective or an adverb. The last thing, event, or person of a particular kind is the one that comes after all the others. He missed the last bus. They met for the last time just before the war. He was the last person to see Rebecca alive. If you want to emphasize that someone or something is the last one of their kind, you can put very in front of last. Those were his very last words. I changed my mind at the very last minute. Latest is sometimes used in a similar way. If something last happened on a particular occasion, it has not happened since then. It's a long time since we met last. If an event is the final one in a series of similar events, you can say that it happens last. You put last at the end of a clause. He added the milk last. Mr Ross was meant to have gone first, but in fact went last. You can also use lastly to say that an event is the final one in a series. You put lastly at the beginning of a clause. They wash their hands, arms and faces, and lastly, they wash their feet. However, last and lastly are not always used in the same way. You usually use last to say that an event is the final one in a series of similar events. You use lastly when you are talking about events which are not similar. For example, if you say 'George phoned his aunt last', you usually mean that George had phoned several people and that his aunt was the last person he phoned. If you say 'Lastly George phoned his aunt', you mean that George had done several things and that the last thing he did was to phoned his aunt. Lastly has a much more common use. You use it to introduce a final point in a discussion, ask a final question, give a final instruction, or mention a final item in a list. Lastly, I would like to thank Mr. Mark Collins for his advice, assistance and patience. Lastly I would like to ask about your future plans. At last and at long last are used to show that something that you have been waiting for or expecting for a long time has happened. These expressions usually go at the beginning or end of a clause. The journey had taken a long time, but they had arrived at last. At long last I've found a woman who really loves me. You use last in front of a word such as week or month to say when something happened. For example, if it is August and something happened in July, you say that it happened last month. Wolfgang and I had lunch with her last month. The group held its first meeting last week. Don't say that something happened 'the last month' or 'the last week'. Last can be used in a similar way in front of the names of festivals, seasons, months, or days of the week. Last Christmas we received more than a hundred cards. I bought these shoes last Saturday. Don't, however, say 'last morning' or 'last afternoon'. Say yesterday morning or yesterday afternoon. It's warmer this morning than it was yesterday morning. Yesterday afternoon I had lunch with Cameron. Don't say 'last evening'. Say yesterday evening or last night. Yesterday evening another British soldier was killed. I've been thinking about what we said last night. When you are describing something that happened in the past and you want to refer to an earlier period of time, you use previous or before instead of 'last'. For example, if you are talking about events that happened in 2005 and you want to mention something that happened in 2004, you say that it happened the previous year or the year before. We had had an argument the previous night. He had done some work on the farmhouse the previous summer. The two women had met in Bonn the weekend before. The quarrel of the night before seemed forgotten. You use before last to refer to the period of time immediately before the most recent one of its kind. For example, the year before last means 'the year before last year'. We went camping the summer before last. I have not slept since the night before last. You can also use last to refer to any period of time measured back from the present. For example, if it is July 23rd and you want to refer to the period from July 2nd to the present, you refer to it as the last three weeks. Note that you must use the. If you want to say that something happened during this period, you say that it happened in the last three weeks or during the last three weeks. He had asked himself that question at least a thousand times in the last eight days. All this has happened during the last few years. Note the order of words in these examples. Don't say 'the eight last days' or 'the few last years'. Don't use 'in the last' or 'during the last' on their own with a plural noun such as 'years' or 'days'. For example, don't say 'Many changes have been made in the last years'. Use a quantity word or a number. For example, say 'Many changes have been made in the last few years'. Or use recent instead. For example, you can say 'Many changes have been made in recent years'. You use latest or last to talk about one of a series of events which is continuing to happen, or one of a series of things which someone is continuing to have or produce. If one of a series of events is happening now or has just happened, you refer to it as the latest one. The latest closure marks yet another chapter in the history of Gebeit. You refer to the event before the latest one as the last one. If no event of the kind you are talking about has happened recently, you refer to the most recent one as the last one. ...the weeds that had grown since the last harvest. If someone keeps having or producing a series of things, you refer to the one they have now or the one they have produced most recently as their latest one. You refer to the one before their latest one as their last one. If they have not had or produced one recently, you refer to their most recent one as their last one. Loach has not been idle since Family Life, his last film for the cinema. You can talk about more than one thing in this way by putting last in front of a number. For example, you can talk about 'his last three books'. Her last two pictures have been disasters. A foot-shaped piece of iron that could be mounted upside down on a pedestal (last stand) about two feet high. 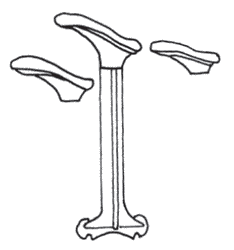 A shoe placed on the “foot” was held in the right position for a sole to be nailed to the shoe. When the nails hit the metal last they were turned back toward the sole and thus were clinched. (Shoe nails were specially designed, and often called “clinch” nails.) Also, see Shoe peg. Since only the front half of a shoe sole usually wore out, only a half-sole was added. Such half-soles were usually of leather, but during the Depression days of the 1930s, soles were often cut from the tread of worn-out automobile tires. Such soles wore well and were a lot less expensive than leather. Noun 1. last - the temporal end; the concluding time; "the stopping point of each round was signaled by a bell"; "the market was up at the finish"; "they were playing better at the close of the season"
2. last - the last or lowest in an ordering or series; "he was the last to leave"; "he finished an inglorious last"
3. last - a person's dying act; the final thing a person can do; "he breathed his last"
4. last - the time at which life ends; continuing until dead; "she stayed until his death"; "a struggle to the last"
7. last - the concluding parts of an event or occurrence; "the end was exciting"; "I had to miss the last of the movie"
Verb 1. last - persist for a specified period of time; "The bad weather lasted for three days"
2. last - continue to live through hardship or adversity; "We went without water and food for 3 days"; "These superstitions survive in the backwaters of America"; "The race car driver lived through several very serious accidents"; "how long can a person last without food and water?" Adj. 1. last - immediately past; "last Thursday"; "the last chapter we read"
2. last - coming after all others in time or space or degree or being the only one remaining; "the last time I saw Paris"; "the last day of the month"; "had the last word"; "waited until the last minute"; "he raised his voice in a last supreme call"; "the last game of the season"; "down to his last nickel"
3. last - occurring at or forming an end or termination; "his concluding words came as a surprise"; "the final chapter"; "the last days of the dinosaurs"; "terminal leave"
4. last - most unlikely or unsuitable; "the last person we would have suspected"; "the last man they would have chosen for the job"
5. last - occurring at the time of death; "his last words"; "the last rites"
6. last - conclusive in a process or progression; "the final answer"; "a last resort"; "the net result"
7. last - highest in extent or degree; "to the last measure of human endurance"; "whether they were accomplices in the last degree or a lesser one was...to be determined individually"
8. last - not to be altered or undone; "the judge's decision is final"; "the arbiter will have the last say"
9. last - lowest in rank or importance; "last prize"; "in last place"
Adv. 1. last - most_recently; "I saw him last in London"
2. last - the item at the end; "last, I'll discuss family values"
1. previous, preceding, most recent I got married last July. 2. most recent, latest, previous Much has changed since my last visit. 3. hindmost, furthest, final, at the end, remotest, furthest behind, most distant, rearmost, aftermost She said it was the very last house on the road. 1. in or at the end, after, behind, in the rear, bringing up the rear I testified last. 1. final decision, final say, final statement, conclusive comment She likes to have the last word in any discussion. Usage: Since last can mean either after all others or most recent, it is better to avoid using this word where ambiguity might arise, as in her last novel. Final or latest should be used as alternatives in such contexts to avoid any possible confusion. verb continue, keep, remain, survive, wear, carry on, endure, hold on, persist, keep on, hold out, abide You only need a very small amount, so the tube lasts for ages. last out hold out, continue, survive I don't know if I can last out till then. last something out get through, survive, continue throughout, hold out during It'll be a miracle if the band lasts out the tour. endmost, hindermost, hindmost, lattermost, rearmost. close, conclusion, end, ending, finale, finish, termination, wind-up, wrap-up. abide, continue, endure, go on, hold out, persist, remain, stay. come through, persist, pull through, ride out, survive, weather. I'll finish it if it's the last thing I do → ¡lo terminaré aunque sea la última cosa que haga en esta vida! for the last time, shut up! → ¡cállate, y que sea la última vez que te lo digo! you haven't heard the last of this! → ¡esto no se acaba aquí!, ¡esto no se va a quedar así! how long will the gas last? → ¿hasta cuándo durará or alcanzará el gas? "only available while stocks last" (Comm) → "sólo hasta que se agoten las existencias"
I've had enough publicity to last me a lifetime! → ¡me han dado publicidad suficiente para toda una vida! (shoemaker) stick to your last! → ¡zapatero a tus zapatos! Much had changed since my last visit → Beaucoup de choses avaient changé depuis ma dernière visite. He missed the last bus home → Il a raté le dernier bus pour rentrer. That was my last pair of tights → C'était mes derniers collants. She wiped off the last traces of make-up → Elle essuya les dernières traces de maquillage. That's the last time I take your advice! → C'est la dernière fois que je suis tes conseils! I got married last July → Je me suis marié en juillet dernier. I got home at midnight last night → Je suis rentré à minuit hier soir. Did you go out last night? → Tu es sorti hier soir? I couldn't sleep last night → Je n'ai pas pu dormir la nuit dernière. I have left my best wine until last → J'ai gardé mon meilleur vin pour la fin. I wish my children to get every last second of pleasure from the outing → Je souhaite que mes enfants tirent jusqu'à la dernière seconde de plaisir de cette excursion. They died to the last man → Ils sont morts jusqu'au dernier. I'm so glad that we've found you at last! → Je suis si content que nous vous ayons enfin trouvé! Here, at long last, was the moment he had waited for → Le moment qu'il avait tant attendu était enfin arrivé. Our house is the last but one → Notre maison est l'avant-dernière. She and I are always the last to know → Nous sommes toujours les derniers à savoir, elle et moi. That was the last we saw of her → On ne l'a plus jamais revue. It was the dog he'd heard the night before last → C'était le chien qu'il avait entendu l'avant-veille pendant la nuit., C'était le chien qu'il avait entendu il y a deux nuits. You are the last person I'd confide in! → Tu es la dernière personne à qui je me confierais! The last thing I wanted to do was teach → La dernière chose que je voulais c'était enseigner. He arrived last → Il est arrivé en dernier. He added the milk last → Il ajouta le lait en dernier. Last but not least do try to get some exercise → C'est le dernier point mais non le moindre: tâchez de faire de l'exercice., Et last but not least, tâchez de faire de l'exercice. I've lost my bag. - When did you see it last? → J'ai perdu mon sac. - Quand est-ce que tu l'as vu pour la dernière fois? They last saw their homeland nine years ago → La dernière fois qu'ils ont vu leur pays natal, c'était il y a neuf ans. When were you there last? → La dernière fois que vous y étiez, c'était quand? When did you last see him? → La dernière fois que vous l'avez vu, c'était quand? When I last saw him, he was wearing a blue shirt → La dernière fois que je l'ai vu, il portait une chemise bleue. The war lasted until January 1992 → La guerre dura jusqu'en janvier 1992. The affair lasted until he met a girl his own age → Leur liaison dura jusqu'au moment où il rencontra une fille de son âge. Make the most of the situation; it can't last! → Profitez au mieux de la situation; ça ne durera pas! The concert lasts two hours → Le concert dure deux heures. His speech lasted exactly fourteen minutes → Son discours a duré exactement quatorze minutes. Their marriage only lasted six months → Leur mariage n'a duré que six mois. This battery lasts twice as long as other makes → Cette pile dure deux fois plus longtemps que les modèles d'autres marques. n → Leisten m; cobbler, stick to your last! → Schuster, bleib bei deinem Leisten! the ___ word → la ___ palabra. adj último; your last period..su último período..su última menstruación; vi durar, alcanzar; How long did the pain last?..¿Cuánto tiempo le duró el dolor?… These pills should last a month..Estas pastillas deberían alcanzarle por un mes. Patriots had given their last cent and now could give no more. Of all the pre-adamite whales yet exhumed, by far the largest is the Alabama one mentioned in the last chapter, and that was less than seventy feet in length in the skeleton. And one thing more do I know: I stand now before my last summit, and before that which hath been longest reserved for me. Whatever questions Agnes has asked of me I have answered to the best of my ability; she knows all that you told me about Francis and the Countess last night. PENDRIL -- The date of this letter will show you that the last of many hard partings is over. We are now, reader, arrived at the last stage of our long journey. I hoped I should be with her at the end, not as the one she looked at last but as him from whom she would turn only to look upon her best-beloved, not my arm but my sister's should be round her when she died, not my hand but my sister's should close her eyes. So they went on into the wood, till at last they came to the place where the woodman was. Like the shadow of a swift and silent death it circled the village, nose to ground, halting at last close to the palisade, where it almost touched the backs of several huts. But this is a true account--in so far as we can find the quaint old ballads which tell of it--and so we must follow one more of these songs and learn how Robin, after living many years longer, at last came to seek his grave.